I've got a ton of great Halloween costume ideas this year, but only one of them is a four-star sure-fire contest winner. I won't be wearing this one on Halloween, but I loved the idea of a Sudoku costume so much, I just had to try building it. The end of the political season signals the beginning of corrugated plastic sheet hunting season. I snagged this 4 foot x 4 foot sheet from a fence on the corner of Sunrise and Fair Oaks in Sacramento. A giant square would be perfectly suited for a big square Sudoku puzzle. I found a nice looking puzzle on the web and printed it out. This would be my model. Corrugated plastic is great stuff. 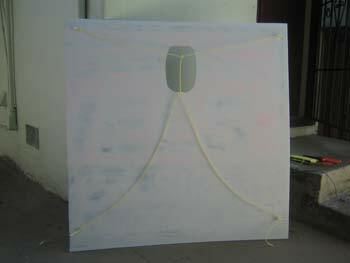 It is lightweight and strong and weatherproof. I used Rust-Oleum plastic primer spray paint to obliterate the fluorescent orange and the candidate's name. 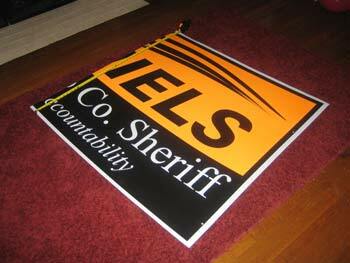 Let this be a lesson to any would-be Sheriffs who are reading this: It is vital to use red, white and blue on your signs if you wish to be elected to public office in the United States. 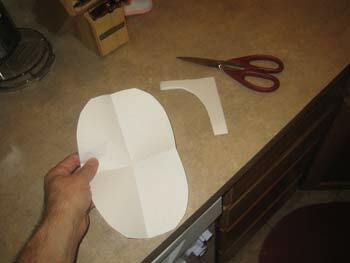 After measuring my head, I folded up a piece of paper and cut out a squared oval. 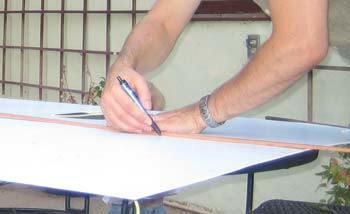 Tracing the oval made a nice symmetrical shape that would become my face-hole in the sign.. The next step was to figure out how to wear this colossus. As I've probably mentioned before, I always try to make costumes that keep at least one hand free for holding a drink. I poked two holes at each of the lower corners and pulled a nylon zip-tie through. 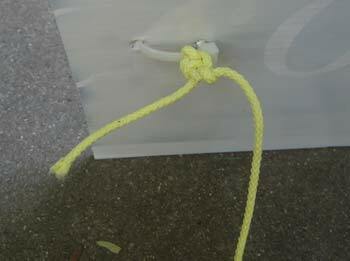 I used some yellow cord to make a loop for across my shoulders. After three tries, the shoulder cord was a suitable length. If you are trying to build something similar, but you don't want to keep donning the costume to adjust the cord length, pull the center of a string up towards the face hole, and adjust the length so that the apex of that string is about an inch above the bottom of the face-hole. One string wasn't enough to secure the board. I added a second cord running along the top of the square. This would keep it from tumbling forward, away from my face. With three more adjustments, this minimalist harness was completed. It felt great, secure and lightweight. 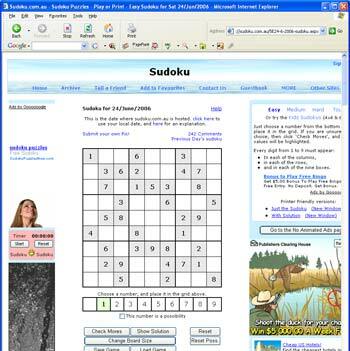 Sudoku puzzles are made up of 81 squares in a 9x9 grid. Dividing 48 inches by 9, I figured that each number square would need to be 5.3 or 5-5/16ths of an inch wide. 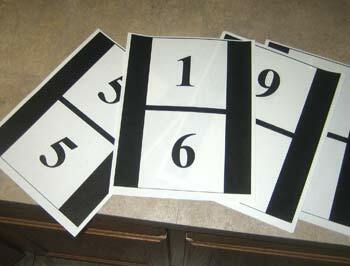 I drew some up in Photoshop and printed them out, two numbers to a sheet. I planned a trip to the copy shop. I'd need five or six copies of each of these. I've provided the images here if you would like to print your own Collector's Edition Numbers: 1/6, 2/7, 3/8, 4/9, 5/5 and blank. This costume was coming together fast. I marked off nine equal spans along each edge and began sketching a grid of 81 squares onto on the front. please continue reading page 2 of the Sudoku Costume.